NOTE: The views and opinions expressed herein are not necessarily those of other breeders. If you have any concerns please consult your animal health carer. A common misconception amongst puppy buyers are "buy a girl as boys lift their legs on everything" Wrong - if your dog does lift his leg on everything you are at fault not the dog. Diligence in the early days of toilet training will make sure this problem does not arise. Most Havanese puppies are keen to be clean. The mothers take care of the personal hygiene until babies are up on their legs and weaned, as soon as they can walk they will find a spot to use away from their bedding. But the owner of a new puppy must remember that puppies have very little control at such a young age. Puppies want to relieve themselves immediately after waking – either from a nap or a long sleep – and after eating. Take your puppy straight outside or to your toileting area and stay with them until they have been to the toilet. It is helpful to use the same word such as ‘toilet’. Pat and praise the puppy before bringing it back indoors. This is a very important part of toilet training and the few minutes you spend each time will reward you in the long term with a clean pet. Young puppies ‘spend lots of pennies’, not only after bed and breakfast. You can often tell the puppy needs to relieve itself when it starts to sniff the floor in search of the right spot. Pick up your puppy and take it outside or to your toileting area. As puppies grow their bladder and bowel control improves, remember though that there will be accidents along the way. Never smack your puppy as your puppy is only excercising a normal function. Rubbing their nose in it is useless and cruel. Never scold a young puppy for an accident, simply clean up and try and be more observant next time. To remove the smell from a hard surface, after cleaning up I find wiping with methylated spirits helps. You can also try cleaning products that break down enzymes such as BioZet. If an accident happens on a rug or carpet I find using bicarbonate the best to remove the odour. I find using ammonia based cleaning product to be ineffective as the ammonia smell tends to attract the puppy back to the same spot. As your puppy is further toilet trained it will let you know it needs to go by simply going to the door you have trained it to go out for toilet stops. They quickly learn to go where you wish them to, but you may need to put in a little extra effort training them away from that special piece of lawn or your timber deck etc. If accidents are frequent, and toilet training is not improving stop and look at your routine with the puppy. You will find in most cases it is poor guidance or routine, not the puppies fault. When out exercising on the lead or in the park, always carry a disposable bag with you and pick up after your Havanese. Aside from the possibility of incurring a fine if you simply walk away from your dog’s mess, it’s most un neighbourly not to pick up. First the lead, I recommend a slip lead. Do not use heavy collars or check chains you will upset your puppy straight away and they will not be easy to train. When they are older a soft webbing collar with a buckle and light webbed lead will do nicely, I still use a slip lead on most of my dogs even when they are adults. Never buy a collar that your puppy will grow into this will make it heavy and cumbersome for the puppy. Start lead training your puppy by putting their lead on them during play time, make sure you have some soft food rewards for your puppy before you start training it, when you want the puppy to come towards you pick up the lead and go to the end of the lead without any pressure on the puppy’s throat, use the food to encourage the puppy to come towards you, if it does give the food to it. If it doesn’t try again, placing the food near the puppy’s nose even give it a small taste, take the food away and the puppy will follow. Always follow the puppy never ever drag or tug it harshly this will only make the puppy more determined not to do it. Always train you puppy with food rewards and when it is hungry. When your puppy does walk on the lead for you praise it lots! If your puppy decides to throw itself around screaming ignore it. If you go to the puppy and pick it up and cuddle it you are only encouraging the bad behaviour. Remember they are not a puppy for very long if you put some positive reinforcement techniques into this puppy from the beginning you will end up with a well behaved puppy. If you don’t you will end up with a neurotic hard to live with pet, it is all up to you. I recommend you take your puppy to puppy classes. Your local dog training club may be able to provide you with guidance in this area. A very handy hint for having a clean, well behaved, easy travelling Havanese is crate training. I know some of you are turning your noses up at the prospect of your beloved pet being in a cage, but, in actual fact a crate train dog is an extremely easy pet to live with. 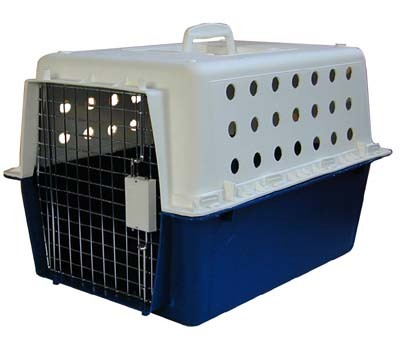 I would recommend a PP40 size crate (pictured below) for a Havanese. To start with travelling in a crate is safe and comfortable for your dog, they have a lovely warm bed to snuggle in and perhaps a chewy and in case of an accident do not turn into a missile to be thrown around the car, which could cause serious injury or even death to you or your pet. By law they must be harnessed or crated whenever travelling in a car. Feeding time is much easier if you feed your dog in a crate especially if they have chickens wings or bones, the mess is confined just to their crate, not your lounge or bed. It will also help keep your puppy focused, instead of being distracted with everything going on around them they will concentrate on their food and become good eater. And lastly when you go on holidays a crate trained dog is easy to leave with anyone just pick up their crate (this becomes like their own bedroom) and take it to your carers, they will have a clean, quiet well behaved dog to look after and won’t mind doing it for you more than once.